List of publications (articles in journals, proceedings etc.) on Birds of Prey (Falconiformes). Not listed are books, contributions in Handbooks, book reviews etc. Reprints or photocopies are available on request. We would appreciate any reprints in exchange. Liste der Veröffentlichungen (Original-Aufsätze in Zeitschriften, Konferenzbänden usw.) über Greifvögel (Falconiformes). Diese Liste enthät keine Buchpublikationen oder Beiträge in Handbüchern, Buchbesprechungen usw. Sonderdrucke oder Photokopien auf Anfrage erhältlich. Tausch erwünscht. Scheller, W., U. Bergmanis, B.-U. Meyburg, B. Furkert, A. Knack & S. Röper (2001): Raum-Zeit-Verhalten des Schreiadlers (Aquila pomarina). Acta ornithoecologica 4: 75-236. (English and German summary available: Home range size, habitat utilisation and time budgets of Lesser Spotted Eagles Aquila pomarina). Meyburg, B.-U. (2001): Zum Kainismus beim Schreiader Aquila pomarina. Acta ornithoecologica 4: 269-278 (English summary and abstract: On Cainism in the Lesser Spotted Eagle Aquila pomarina). Komischke, B., K. Graszynski & B.-U. Meyburg (2001): Zur Biologie des Schelladlers Aquila clanga. Acta ornithoecologica 4: 337-376. (Abstracts in English, German and Russian: On the Biology of the Greater Spotted Eagle Aquila clanga). Ostrowski, S., E. Fromont & B.-U. 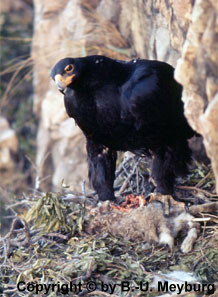 Meyburg (2001): A capture technique for wintering and migrating Steppe Eagles in south-western Saudi Arabia. Wildlife Soc. Bull. 29: 265-268. Meyburg, B.-U. 2002. On Cainism in the Lesser Spotted Eagle (Aquila pomarina) and a possible Explanation for the Phenomenon in this and other Eagle Species. Pp. 53-61 in: Yosef, R., M.L. Miller & D. Pepler (eds. ): Raptors in the New Millennium. Eilat: Intern. Birding & Research Center. Graszynski, K., B. Komischke & B.-U. Meyburg 2002. On the Biology of the Greater Spotted Eagle (Aquila clanga Pallas 1811). Pp. 62-75 in: Yosef, R., M.L. Miller & D. Pepler (eds. ): Raptors in the New Millennium. Eilat: Intern. Birding & Research Center. Meyburg, B.-U., T. Langgemach, K. Graszynski & J. Böhner (2004): The Situation of the Lesser Spotted Eagle Aquila pomarina in Germany: The need for an Action Plan and active Conservation. Pp. 601-613 in: Chancellor, R. D. & B.-U. Meyburg (eds. ): Raptors Worldwide. Budapest: WWGBP & MME. Meyburg, B.-U., W. Scheller & U. Bergmanis (2004): Home range size, habitat utilisation, Hunting and Time budgets of Lesser Spotted Eagles Aquila pomarina with regards to Disturbance and Landscape Fragmentation. pp. 515-635 in: Chancellor, R. D. & B.-U. Meyburg (eds. ): Raptors Worldwide. Budapest: WWGBP & MME. Helbig, A.J., Seibold, I., Kocum, A., Liebers, D., Irwin, J., Bergmanis, U., Meyburg, B.-U., Scheller, W., Stubbe, M. & S. Bensch (2005): Genetic differentiation and hybridization between Greater and Lesser Spotted Eagles (Accipitriformes: Aquila clanga, A. pomarina). J. Ornithol. 226-234.